“I felt like my bat came around and hit the back of my Achilles,” Philadelphia Phillies star slugger Ryan Howard recalled after tearing his Achilles tendon.1https://www.muirortho.com/achilles-tendon-tear/ “I tried to run and felt a pop and it felt like the whole thing was on fire…like I was literally on a flat tire. I tried to get to get up, but I couldn’t go,” he added. The feeling of an acute Achilles tendon tear is simply awful. Yet, for many patients we see, their woes don’t end there. Chronic tendinopathy can persist for many, many months after initial tendon damage. Doctors who treat tendons used to call the residual pain “Achilles tendinitis,” believing that the pain was related to chronic inflammation and swelling. Now we know this is not true. The term we use is “Achilles tendinopathy,” which refers to a tendon that has weakened or degenerated due to abnormal healing patterns. Today we take a look at a few different modern methods of treatment that have shown great results in our NYC podiatry practice, compared to some of the older therapies for tendon damage. Over the years, research has debunked the myth that static stretching can prevent tendon injuries or produce any noticeable benefit once the tendon has been injured. In fact, stretching can actually reduce sprinting speed and vertical jumping capacity, compromising tendon function further! Instead, our Achilles tendinopathy treatment employs eccentric exercises that lengthen muscles under resistance.2http://rheumatology.oxfordjournals.org/content/47/10/1444.full These exercises increase collagen synthesis and help restore proper tendon structure. When you’re feeling better, we can introduce heavy, slow resistance therapy to build muscle and improve your overall strength. We have found a better approach is to inject platelet rich plasma into the damaged area of the tendon, which provides the body with a richer supply of growth factors, oxygen, and platelets, while triggering natural healing. 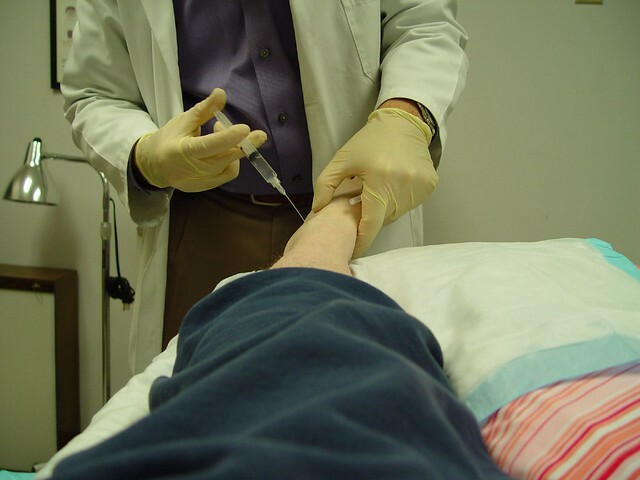 We also use biopuncture therapy as a natural way to facilitate tendon healing. Surgery is still viewed as a last recourse, even though the techniques and approaches to surgical intervention have improved over the years. In the past, surgeons would open up the ankle with a rather large incision up the back of the leg and stitch frayed ends of a torn tendon back together with the patient under general anesthesia. If you’re interested in learning more about our methods, take a look at a story of one runner, and how a combination of therapies employed by The Center for Podiatric Care and Sports Medicine helped him get back to what he loved doing. If you are suffering from pain in your Achilles tendon, contact us to learn more about the services our board-certified professionals provide in our two state-of-the-art Manhattan and Westchester podiatric sports medicine centers. Our approach is based on the latest groundbreaking research, never on dated models of treatment.